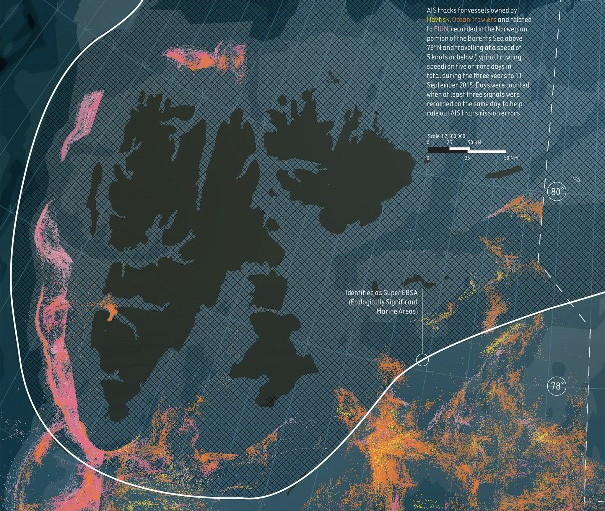 «This far, but no further» Greenpeace says about the quick Arctic expansion of industrial fishing. According to the environmental organization, trawlers are now quickly moving into areas which until recently were covered by ice. That poses a serious environmental challenge to the region, the organization says in a new report. The publication titled «This far, no further» argues that the trawler fishing could make irreplaceable damage to the ecosystems. A new marine protection zone should be established in the area, Greenpeace proposes. «Fishing brings with it the threats of habitat degradation and bycatch, potentially wiping out marine life and putting this whole fragile ecosystem at risk», the report reads. Investigations made by the group show that the fishing industry use destructive bottom trawling which are invading the previously pristine Arctic areas. The investigations are based on analysis of 18 million satellite tracking pictures (AIS data) of vessels in the area. While fishing in the waters east of Svalbard in 2001 accounted for only 2 percent of the Barents cod quota, it in 2014 totaled 11 percent, the organization says. Among the most active companies in the area are Norwegian Hagfish and the Russian Ocean Trawlers and FIUN. «We request Norway to establish a marine protection area in the waters around Svalbard and recommend the seafood producers to request their suppliers to immediately stop fishing in this vulnerable area», Greenpeace says in a press release.